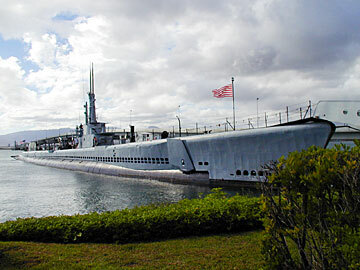 The USS Bowfin is moored between the USS Arizona Memorial Visitor Center and the Ford Island bridge. Appropriately this week, we turn to the ship known as the "Pearl Harbor Avenger," USS Bowfin, so called because it was launched at Portsmouth Boatyard on Dec. 7, 1942, a year to the day after the attack on Pearl Harbor. Bowfin, centerpiece of the Pacific Fleet Submarine Memorial Association exhibit on the other side of the big-top venders' tent from the USS Arizona Memorial Visitors Center, is possibly the best-preserved American submarine of the World War II years. The reason is that it was only fitfully "modernized" after the war, and many of its fittings are vintage. Bowfin is of the class of submarines called Balao, a souped-up edition of the Gato submarine, the standard American undersea boat of the war, all of which were named after fish. The bowfin is an aggressive and hungry game fish found in the Great Lakes. The submarine had nine successful war patrols, claiming 39 Japanese merchant ships and four Japanese military ships sunk, with a Vichy French ship thrown in for good measure, totaling as much as 213,580 tons sunk or damaged. Among American submarines, it ranks 17th in tonnage and 15th in number of ships sunk. Unlike other submarines, Bowfin also destroyed -- by accident -- a Japanese military bus parked on a pier. Visitors to the site can tour the Bowfin itself (it's cramped, but that's the way it was aboard a fleet boat) and tour the submarine museum (full of cool stuff and exhibits) or check out the other exhibits on the grounds (including a Japanese suicide submarine), visit the memorial to submarines lost "on eternal patrol" (52 subs and more than 3,500 submariners) or shop in the well-stocked gift shop (which should be called "Das Bootique" but isn't). The museum organization hosts regular "Adventures in History" lectures. Check the museum Web site at www.bowfin.org or call 423-1341 to get information.